New control features maximize discrete to continuous pulp measurement benefits in total pulp quality management, enhance process stability and save on chemical costs. 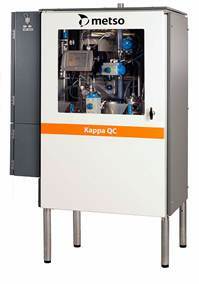 Metso has further developed its industry-standard online Metso Kappa Analyzer (Metso Kappa Q) by now introducing an enhanced Metso Kappa QC version. For the first time, a fiberline analyzer not only measures pulp lignin content and brightness, but also includes a new unique stabilizing control capability in all process stages, from the oxygen stage up to the finished pulp. The new control capabilities incorporated enable pulp makers to improve total pulp quality management, boost process stability and gain major savings in chemical costs throughout the process stages. The enhanced version of the Metso Kappa Analyzer represents the fourth generation of Metso's pioneering pulp mill analyzer technology. For almost 40 years, Metso's products have played a key role in the evolution of chemical pulp mill delignification and bleaching controls. Today, Metso Kappa and brightness analyzers and the well-known inline sensors provide the standard platform for process optimization and quality control at most of the leading chemical pulp mills in the world. Metso has the world's widest scope of automation solutions and services for the pulp and paper industry - from fiber to print and from single measurements to mill-wide turnkey automation projects. It is the market leader not only in analyzers, but also in quality control systems as well as in control and on-off valves for this industry sector. Metso's system-independent solutions help customers lower their operating and maintenance costs, and keep their assets' operating value as high as possible. Thanks to a flexible structure, the measurement capacity of Metso Kappa QC can easily be expanded by adding measurement modules and sampling points. Measurement capacity alternatives include 10, 20, 30 or 40 measurements per hour. It is also possible to benefit from the analyzer's advanced continuous Kappa measurement and COD index in applications where fast changes in process conditions and washing efficiency exist by using inline sensor integration in the control structure. 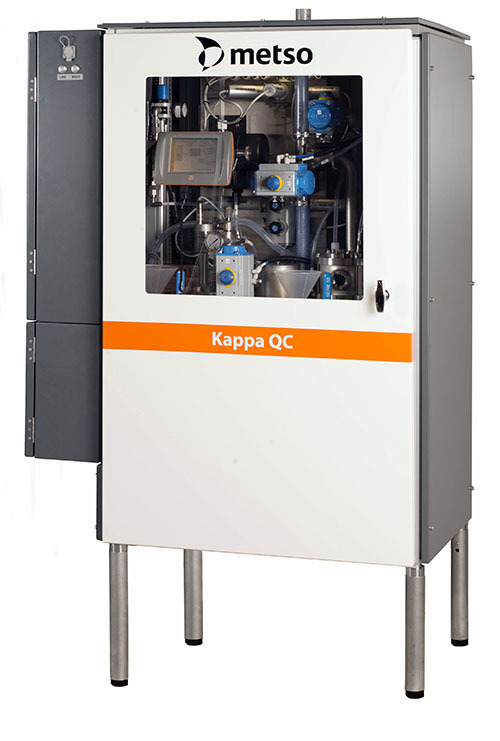 To fully utilize the efficiency, safety and ease of use of the Kappa QC centralized user interface, Metso is introducing a new high-definition touch screen as part of the new analyzer unit.